There was a cooking program that I used to love called Simply Magic. It is an Australian cooking show presented by Kylie Kwong and it features Chinese food. Her recipes are healthy, made with fresh ingredients, and they are attainable in a home kitchen. Needless to say… I adore her. It was while watching her show that I saw a recipe for Chicken Fillets with Honey and Ginger. I made them the very next day and they were wonderful. So good in fact I made them for my Taiwanese mother-in-law who enjoyed them very much. I did wonder, however, how the recipe would taste with beef. 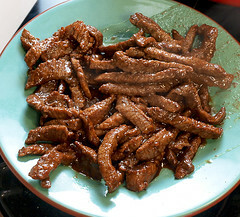 And so, for my third Texas Beef Council* recipe, I give you my beefy adaptation of Kylie’s dish. For the chicken I used some lean round steak. 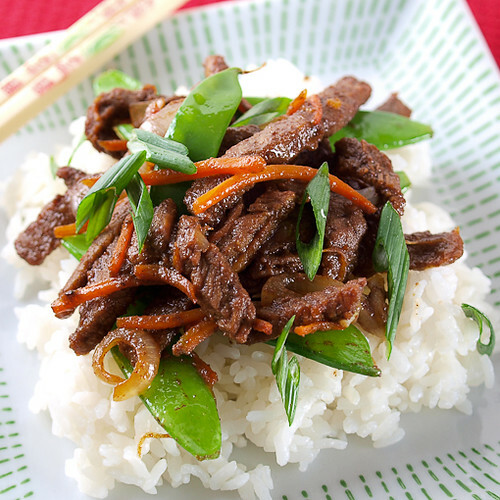 I love round steak for stir-fry since it packs a lot of flavor and stays tender after cooking. 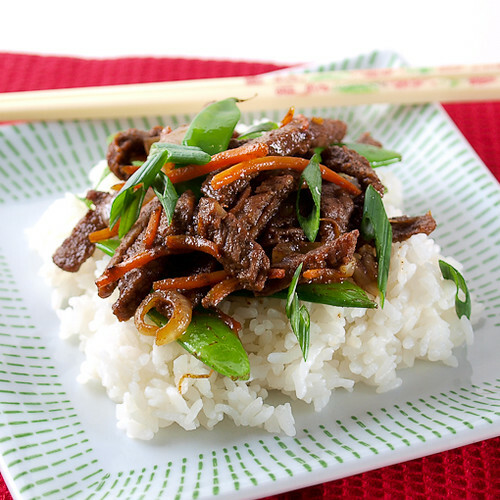 The marinade is sweet and savory, and as the beef cooks the marinade thickens and caramelizes into a sticky glaze. I added some vegetables to my dish in the form of onions, carrots, and tender snow peas for balance, and visual appeal. 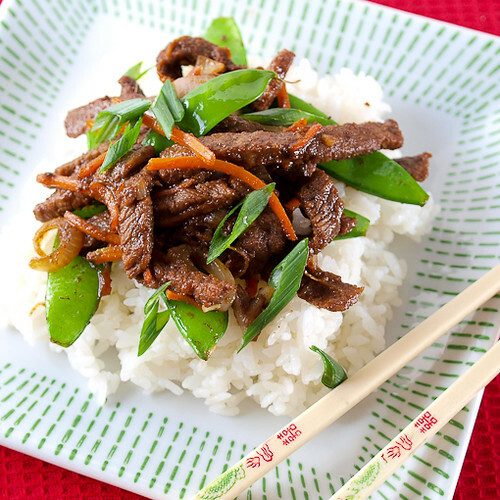 Serve this on some freshly cooked rice and you have a crowd-pleasing dinner! 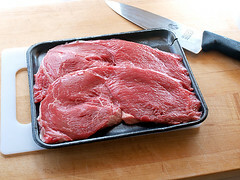 Slice the steak into very thin strips, no thicker than 1/4-inch, making sure to cut the strips against the grain. Set aside. 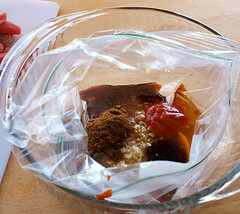 In a plastic bag mix together the honey, soy sauce, shao hsing wine (or sherry), ginger, oyster sauce, sriracha, orange juice, five-spice, and sesame oil. Add the thinly cut beef and massage to be sure all the beef is well coated. Refrigerate for two hours, or overnight. 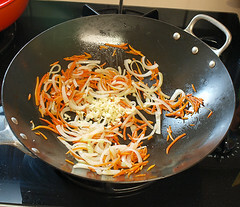 Once the beef has marinated heat a wok, or large skillet, over medium-high heat. Add 1 tablespoon of the oil and heat until it shimmers. Add half the beef and allow to sear for thirty seconds before stirring. Cook until the beef is brown, about 1 minute, then remove from the pan. Add the remaining beef and cook until browned. 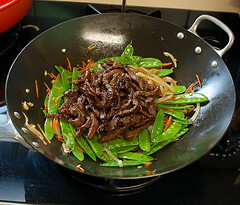 Return the first batch of beef to the wok and increase the heat to high. 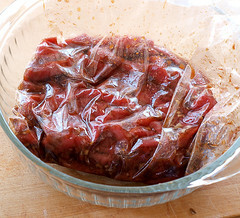 Cook until the beef is coated in a sticky, caramelized glaze, about two minutes. 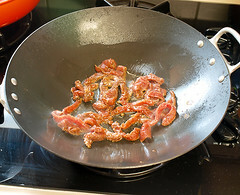 Remove the beef from the pan and rinse the wok. 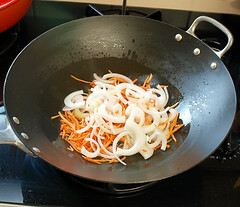 Return the wok to medium-high heat and add the remaining oil. Heat until it shimmers and add the carrots and onions. Cook, stirring constantly, until they begin to soften, about two minutes. Add the ginger and garlic and cook for thirty seconds, or until fragrant. 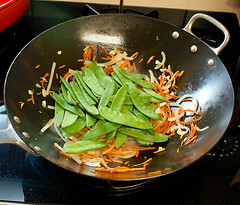 Add the snow peas and the soy sauce and cook for two minutes, or until the snow peas are bright green and tender. Add the beef to the wok and toss well. 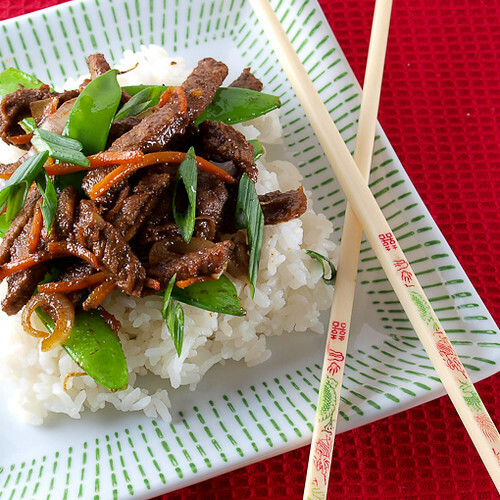 Serve over cooked rice with green onions as a garnish.